Galeb Optics provides the tools for design and manufacturing of optical thin film coatings. 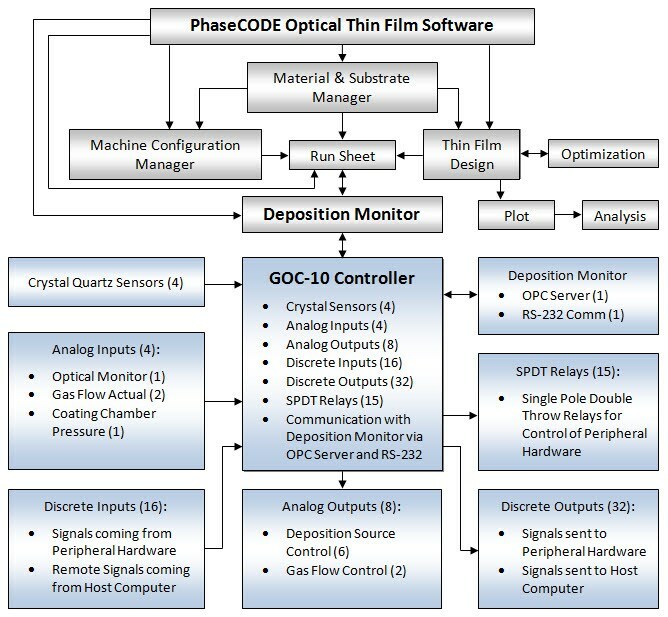 PhaseCODE, our design and production software, is used to design optical coatings, to control the deposition process via the PhaseCODE Film Thickness Controller GOC-10, and to configure the I/O of the GOC-10 controller for a given coating deposition system. The PhaseCODE offers a high level of process automation. It is also a human machine interface (HMI) between the operator of the coating machine and the GOC-10 controller. GOC-10 controller can be conveniently incorporated into a new or an existing deposition system and used as a master sequencing controller for demanding thin film deposition applications, particularly the co-deposition. The GOC-10 controls various process parameters and hardware components such as the deposition rates, the film thickness, the deposition sources, the crystal sensors, the system gases, the e-gun power supplies, the crucible controllers, and the user defined I/O devices. The idea behind the PhaseCODE program structure and its computational capability is to unify various aspects of optical thin films, from the material and substrate analysis to the coating design and the coating production. The multifaceted nature of optical thin films expressed in terms of the refractive index, the extinction coefficient, the physical thickness, the optical thickness, and the phase thickness, can only be fully recognized by taking into account each constituent to examine its role throughout the coating cycle that begins in the design form and ends in the coating machine. With unsurpassable I/O capability to accommodate and control multiple hardware components of the coating deposition system, the GOC-10 offers the most advanced process control solution for the optical coating industry. The PhaseCODE "dynamic I/O allocation" algorithm greatly simplifies the process of integrating the GOC-10 into a new or an existing deposition system. (15) SPDT (single pole double throw) relays (22 predefined parameters). The I/O logic of the GOC-10 controller for all predefined and user defined parameters is an integral part of the PhaseCODE software, therefore completely eliminating the need for I/O logic programming on the part of a user.